The entrace hall is fitted with a intercom system. This sunny spacious sitting area has an armchair and three-seater sofa, which doubles as double bed. Free (limited) WiFi Internet and a colour LED TV with digital reception are also at your disposal. The dining area is located between the sitting area and kitchen and seats four. The kitchen is fully equipped with all the modern appliances including a microwave, washer. Dinner service, cutlery, pots and pans are all available. 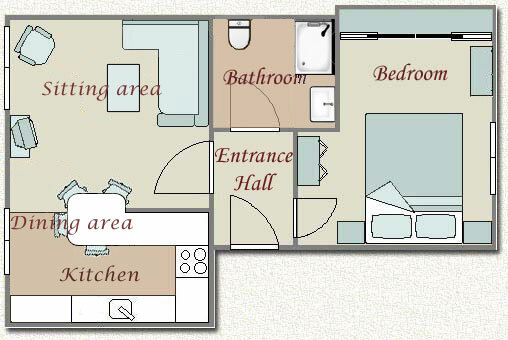 he spacious bathroom is fitted with shower, wash basin, and lavatory. The spacious and bright bedroom looks out over the quiet square and houses a double bed and a large built-in wardrobe with full-length mirrors. All bed linen is included.